A 19th-century pipe carved by the Haida people of the Pacific Northwest. CAMBRIDGE — “All the World Is Here,” the new exhibition at the Peabody Museum of Archaeology & Ethnology, has three subjects. The subtitle identifies two of them: “Harvard’s Peabody Museum and the Invention of American Anthropology.” The third, the 1893 World’s Fair, may appear unrelated. Part of the interest of “All the World Is Here” is learning why it’s not. The show is something of a victory lap. Last year, the Peabody celebrated its 150th anniversary. “All the World Is Here” could be seen as a description of the museum, with its collection of more than 1.2 million objects. Without meaning to, Alexander Pope gave anthropology a motto 300 years ago: “The proper study of mankind is man.” The Peabody bears witness to the extent of that study. The founding of the museum and its impact on anthropology as an academic discipline provide the show’s framework. The 1893 World’s Fair served as a kind of showcase for both, thanks to the exposition’s Anthropology Building. The fair looms large in “All the World Is Here,” right down to the presence of admission tickets, souvenirs, a “World’s Fair Cookbook,” and display about the fair’s biggest attraction, the first Ferris wheel. Two of the more startling exhibits relating to the fair are a reproduction of an Anthropology Building display on pre-Columbian Costa Rica (no labels or textual information back then!) and a pair of statues showing “the typical Americans” of 1893. Typical in Cambridge, maybe: The proportions were based on a decade’s worth of measurements of Harvard and Radcliffe students. Never fear: Sculptural genitalia were either concealed (male) or not rendered (female). The modern-day Adam and Eve were meant to contrast with the many nearby displays on indigenous peoples. The more than 600 items in “World” can be seen as the Peabody collection in microcosm, if such a thing is possible, with sections devoted to such important subjects in the museum’s past as it longstanding excavation of Mayan ruins in the Copan Valley, in Honduras, and its role in helping save the ceremonial earthworks of pre-Columbian Mound Builders in the Midwest. The size of the show makes its compactness all the more impressive. It fits into a single, very handsomely renovated gallery on the museum’s fourth floor. The cherry-and-glass display cases are themselves things of beauty. Objects range from Admiral Robert Peary’s dog sledge (used for explorations in Greenland) to the pipe and sketchbook of Frederic W. Putnam, Peabody director in 1875-1909, from Javanese puppets to Hopi pottery (both on display at the fair). Some of the objects are surpassingly beautiful. The delicacy of the embroidery on an Innu sealskin hold-all, from northeastern Canada, is a marvel. Some are charming. 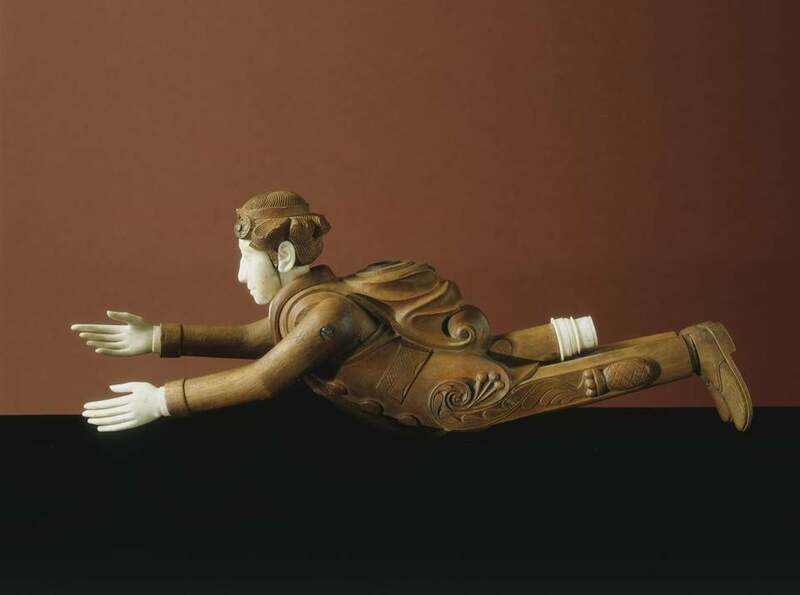 A 19th-century pipe carved by the Haida people of the Pacific Northwest looks like a skydiver. Was Peabody tempted to pocket it? Some are scary. The size of the tomahawk once owned by the Ponca chief Standing Bear would give pause to a lumberjack. And some are really scary. A late-19th-century osteometric tool kit, for measuring the size and shapes of the head, looks like a torture kit — and shows how far anthropology has come. Why measure heads and skulls? Because size and shape were considered such clear indicators of intelligence and character — like race and ethnicity, only more quantifiable. Sometimes man has been the improper study of mankind.